Crossing the Drake passage from South Argentina to the Antarctic Peninsula is something you’ll inevitably have to do if you dare venture to this elusive seventh continent by ship. The Drake passage is a large body of water south of Cap Horn in south Argentina. This passage is particularly rough as on this latitude the water can flow freely all around the world without being slowed down by land. This is the only place in the world where the water flows unhindered without any land mass stopping it. Furthermore, due to the shape of South America and the Antarctic peninsula this passage becomes very narrow (compared to the Pacific Ocean and the Atlantic Ocean) and acts as a funnel where the two oceans meet, creating very rough conditions. Many sailor stories feature ships crossing south of Cap Horn to get to the other side of the Americas and many of those ships end up as wrecks. Now, with the opening of The Panama Canal in 1914, they don’t have to go there anymore (although many ships continued to do so for a while after). Unless, of course, you want to go to Antarctica. Another way is to fly to Antarctica but even that requires special conditions and planes can be grounded for days, weeks and even months waiting for the winds to change. Depending on the conditions, your trip across the Drake can range from anything from a relatively calm experience to one of the roughest passages in the world. Colloquially, these are known as either a “Drake Lake” or a “Drake Shake”, respectively. By “calm” we’re talking 2 days of 2-3m waves – not more than most people will be fine with rest, some fresh air and a couple of seasick pills. It’s still a rough time if you’re not used to it but you’ll survive. This is what we had on the way back. On the way out though, we had a “Drake Shake” with 5-meter waves coming from the side. This is enough to slide plates off tables and it’s enough that you can’t sleep on the side. It was also enough that half the ship was sick in their cabins, even with pills. Although, it was hard for me to sleep properly (because I was constantly rolled around), I felt fine and a few seasick pills kept me in ace condition. 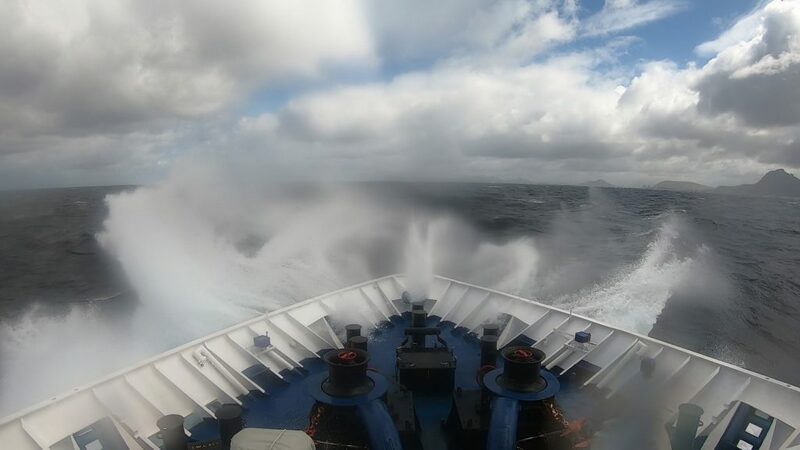 It takes two days to cross the Drake Passage in a cruise ship and those days can be the longest days of your life if you do it in the wrong conditions. Luckily, in modern times we have charts and weather reports that help us avoid these conditions – in fact, as this post is being written dozens of modern ships are waiting in port in Ushuaia due to weather conditions. They simply can’t cross it without putting their passengers in danger. Back in the old days, the ships were weaker and they didn’t have proper charts. I wouldn’t want to cross the drake during those times – let alone be the first adventurer to explore south. One good thing, though, is that when you get to the other side – a new world awaits! Thor Winther is an engineer by profession but has been travelling the world full time since late 2015. He is the author of www.worldwidewinther.com, a blog focused on budget/backpacking solo round-the-world travelling.